I would like to have a Caricature in colour marker with theme - with background & body. 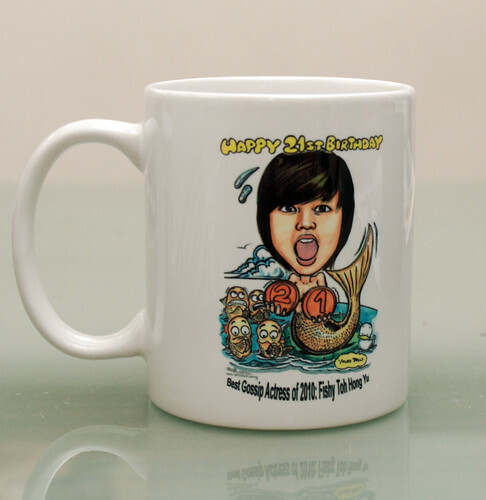 It is for my friend Fishy Toh 21st birthday on the 17th April. I have attached 6 random pictures of her, feel free to pick any of the expression, to match with the theme. 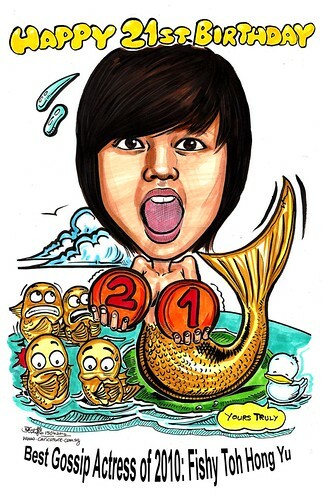 Caricature of her in a mermaid suit with 2 basketballs infront and the no. 21 (either on the mermaid suit or on the basketball)? Or if you have any suggestions where to put 21, feel free to do so. Is it possible to add 4 small little fishes in jersey suits, so that it adds up to form a team? Caricature of her in a normal basketball jersey or mermaid suit with no. 21 with 2 basketballs infront doing a slam dunk? From: Duck (either a small yellow normal duck those in pond type, or a donald duck) as to represent as a gift from me. Feel free to add in any imaginations of yours to make it looks good! Caption wise, I still haven't think of it beside "Happy 21st Birthday" I don't know what else, was hoping to have something more different. If you have any idea please let me know, thank you!" 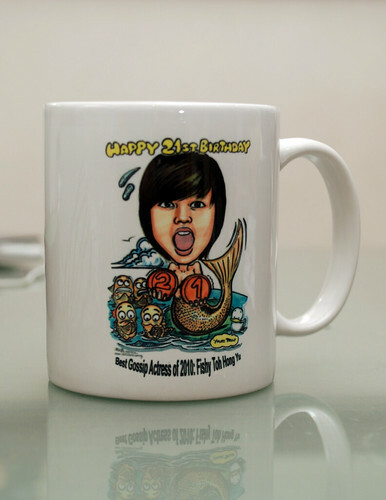 Caricature printed on mug - front and back. Initially, I proposed to have a thermal mug. This special mug is in black colour. The image will not appear when it is cold. However, when you pour in hot water, the image will slowly appear, within a minute. My suggestion to her:- present it to the burthday girl at the party. Tell her it is a special mug. Pour in hot tea or water. Smell it with your eyes closed. Then take a video of the reactions of her friends, while the caricature appears slowly. It should be fun. Let's try it next time.